On the northwest side of Milwaukee, Mark Borchardt dreams the American dream: for him, it’s making movies. Using relatives, local theater talent, slacker friends, his Mastercard, and $3,000 from his Uncle Bill, Mark strives over three years to finish Coven, a short horror film. 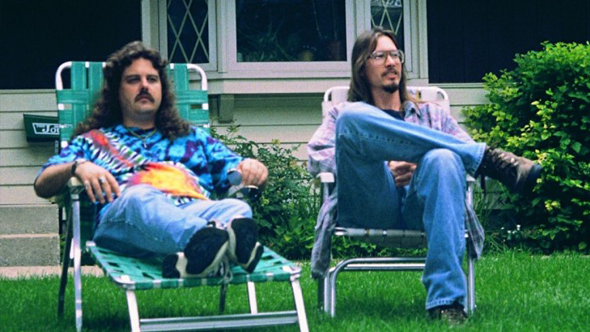 Meet Mark Borchardt, the funny, garrulous subject of the not-to-be-missed documentaryAmerican Movie. He’s someone you won’t soon forget. He has dedicated himself to making a no-budget black-and-white horror film that features homemade scarecrows and primitive acting, one that’s not about to rival The Blair Witch Project in anything but the expletive department. But that doesn’t matter. The point is that Borchardt cobbles together this project as if his life depended on it, because it does. Insightfully and stirringly, not to mention hilariously, American Movie shows why. “The American Dream stays with me each and every day,” Borchardt says when he speaks of his motivation. And he likes to drive past big, sterile new houses to illustrate what that dream means. But as captured here so intimately by Chris Smith, Borchardt is already living through a much darker and more authentically American story. As hard as he works to attain what he wants, he’s struggling even harder to escape what he has. Then the film starts to open, like a slow iris shot, onto the larger landscape of his life. When it comes to obstacles, he has a brother who announces that Borchardt would have been best suited for a factory job. And that’s just for starters. Smith, who made the film working closely with Sarah Price, builds a surprising amount of suspense and even shock into this documentary’s gradual revelations about its subject. By the time Borchardt is seen doing a dead-end job at a cemetery and describing the worst kind of work he’s ever been faced with, the film has built up an enormous amount of empathy and hope for him. But even those parts of American Movie that display the most Crumb-like poignancy have their share of affectionate humor. Take Uncle Bill Borchardt, the only family member who might conceivably lend Mark any money. Mark Borchardt woos his uncle into the movie business by flashing a picture of a pretty young actress and announcing, “She wants to be in your movie, Bill.” Almost before Bill can exclaim, “Oh, my gosh,” he has been enlisted as the producer of “Coven,” which his nephew likes to mispronounce as KO-ven because he doesn’t want it to rhyme with oven. When he gets an idea, he tends to stick with it all the way. “I see great cinema in this,” he says at one point, causing the woozy, pitifully fragile Bill to ask, “Cinnamon?” Smith has a wonderful ear for moments like that and does an expert job of extracting them from the 70 hours of film he originally shot. Because Borchardt had been recruiting friends and relatives for projects like “The Creeps,” “I Blow Up” and “The More the Scarier III” since he was 14, everyone here is very comfortable with a camera rolling, and very revealing. Borchardt’s friend Mike Schank, who seems to have wandered in dazed from a Kevin Smith movie, tells about a near-death experience on drugs. Then he giggles nervously and offers to tell some more. While Borchardt struggles to overcome a history of alcoholism, Schank goes him one better. He has an Alcoholics Anonymous sponsor who also drives him to Gamblers Anonymous meetings. American Movie begins with Borchardt’s ambition to make an autobiographical film called “Northwestern,” American Movie which is meant to be an ambitious exploration of his upbringing in Milwaukee. Since this soon proves to be a non-starter, he vows to raise the money for it by completing “Coven” and selling 3,000 video copies. It is soon revealed that this won’t be easy, as Borchardt lies in the snow filming friends in black hooded capes (“Now you guys gotta look menacing!” he directs), bungles a scene in which a cabinet door is supposed to break on a friend’s head, and otherwise shows why the road to a finished “Coven” is full of potholes. By the time American Movie completes its own mission, it has blossomed wonderfully into much more than a portrait of one fiendishly determined filmmaker. For anyone wondering where the spirit of maverick independent filmmaking has its source, you need look no further.